Size/Color: Barunit/Black This item is currently out of stock! 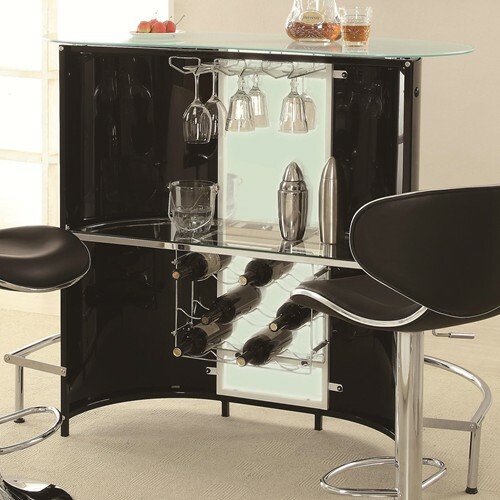 Impress your guests with this contemporary bar unit that will bring sleek modern style into any space. 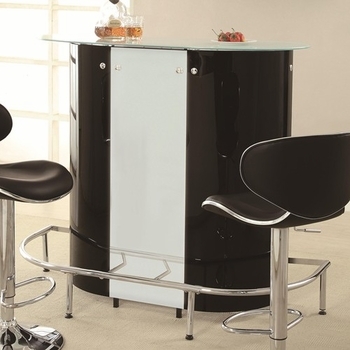 With a unique kidney-shaped body in a cool black and white acrylic, this bar unit offers plenty of storage for your every organizational need. A stemware rack, wine bottle storage, and glass preparation surface all provide this unit with convenient functionality that will make entertaining guests a breeze. The wrap-around chrome footrest offers support and additional comfort, while a frosted tempered glass counter surface completes the cool updated style of the piece.